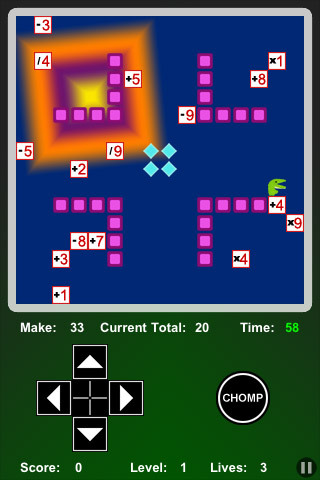 Math Chomp is my latest iPhone App development, an educational app that is suited to both children and adults. The game appeared on the App Store earlier this week, and immediately occupied Position #1 in "New and Noteworthy" in Games -> Educational and Games -> Kids in iTunes UK as well as Position #2 in the Education section! In the game you help Craig the Crocodile to perform mathematical calculations to achieve the target number in each of the 30 levels in the game. Control is achieved using an on-device "D-Pad" and "Chomp" button. The game features online high scores and Twitter "tweet my score" functionality. Again, the app has been developed in Visual C++, utilising DragonFireSDK. Marketing wise, I have made a press release, and have been trying to get various Educational Apps type websites to review the app. I have also made the decision to make the app free (for a limited time only) during the "New and Noteworthy" period, to capitalise on exposure, and attract user reviews. but will also work on the Apple iPad. and has been in development "off and on" since late last year!